The trucking industry in the US is growing (more than 80% of all cargo is moved by trucks and the total number of people employed in trucking businesses exceed 7mln). At the same time, trucking remains heavily regulated as the Federal Motor Carrier Administration is working to reduce the number of accidents involving commercial vehicles. Each new piece of legislation affects existing businesses as fleet owners and drivers need to make sure their operations comply with most recent regulations. As of december 18, 2017 a new Electronic logging device (ELD) mandate took effect. All drivers and carriers who are found non-compliant with this mandate will be subject to penalties. In the past certain businesses were logging work hours in paper logbooks, but now they all will have to switch to electronic records. This change in laws drives a need for software applications that together with special hardware devices can be used as a part of hour-logging system. Before we explain what kind of apps might help trucking businesses comply with updated regulations let's look into who has to comply with this new regulation. Which trucking businesses are required to comply with new ELD regulations in 2018? All trucking companies whose drivers have been recording their working hours using paper logbooks will now have to switch to ELD records. ELD is a laptop, smartphone or a tablet that contains special software that automatically records drivers' hours of service. ELD has to be synchronised with the commercial motor vehicle and should meet technical specifications described in the ELD mandate. Who will be exempt from complying with 2018 ELD mandate? - Drivers (non-CDL) who operate within 150 air miles of their starting location. E-logging app development: what you need to know about hardware and software that make your businesses compliant with new regulations. Let's look at the underlying technological requirements before making the decision to develop a trucker logbook app. A traditional paper logbook is a notebook, with a time grid on every page dividing the 24-hour day into 15-minute segments. E-logging software allows drivers to generate a Record of Duty Status and submit the record with an electronic signature. This type of e-logging software doesn’t provide a connection to a truck’s engine, but rather relies on a driver’s manual input of HOS information. Automatic On-board Recording Devices (AOBRD) connect to the engine and record driver HOS information that can be shared with dispatchers. AOBRD devices can also produce a driver’s HOS chart upon demand. Fleet management systems provide a robust suite of different applications from GPS fleet tracking to messaging and fuel monitoring. Fleet management systems also includes an AOBRD component. Electronic Logging Devices (ELDs) are the future for long-haul truck drivers. They synchronize with a truck’s engine to capture power status, motion status, miles driven, and engine hours. The ELD dataset includes date, time, location, engine hours, vehicle miles, as well as identification data on driver, vehicle, and motor carrier. As of 2018-2019, authorities may request access to Records of duty status through by data transfer. A hard-wired connection to the truck’s engine, interfacing with the Engine Control Unit. Resistance to tempering and support for data integrity check functions. Vehicle location tracking and automated entry at each change of duty status. Graph grid for presenting a driver’s daily status changes either on a display unit or on a printout. A driver should be allowed to log in and select “on-duty,” “off-duty,” or “on-duty not driving” status (“driving” status must be automatically activated by vehicle movement). HOS data should be standardized for transmission to law enforcement officers on a real-time basis using wireless connections such as Bluetooth. Fleets already equipped with electronic logging technology will have until December 2019 to ensure compliance with the published specifications. Now let's discuss how you can build an electronic logbook app for truckers in more detail. According to the ELD mandate, an HOS electronic logbook solution for smartphones or tablets consists of three parts: 1) a mobile app for a driver, 2) a mobile app for a dispatcher, and 3) a hardware device that connects to the truck’s engine. AOBRDs that are already in use by some US drivers can potentially be turned into ELDs if their providers manage to get them certified. No existing solutions are ELD-certified, but there are devices that claim to be ELD mandate-ready (e.g. 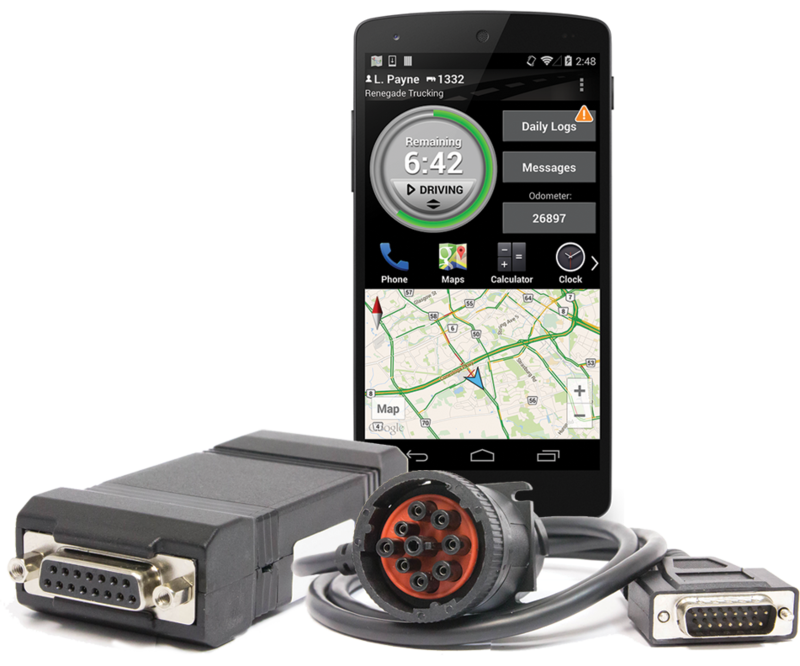 the KeepTruckin Electronic Logging Device and BigRoad’s DashLink). How does an ELD connect to the truck’s engine? Under the hood of modern vehicles there is a fully-fledged electronic system that communicates with various sensors, constantly measuring speed, acceleration, braking, orientation, steering angle, wheel rotation, and more. The core of this system is formed by microprocessing modules known as Electronic Control Units (ECU), each of which controls a specific set of functions – engine, transmission, automatic braking, airbags, power windows, air conditioning, and so on. There are about 70 ECUs in a modern vehicle. ECUs communicate with each other using standardized protocols, of which there are several. The most common standard is called Controller Area Network (CAN). CAN enables a constant flow of data signals among sensors, actuators and ECUs within the vehicle, but doesn’t have a central hub. The system of electronic communications within each vehicle varies by manufacturer, and automakers apply strong technical security measures to prevent unauthorized access to their vehicle networks. There is, however, one exception to this rule: vehicle data controlled by the Engine Control Unit can be made available via the On-Board Diagnostic (OBD) port, a standardized hardware interface located within two feet of the steering wheel, typically under the dashboard. 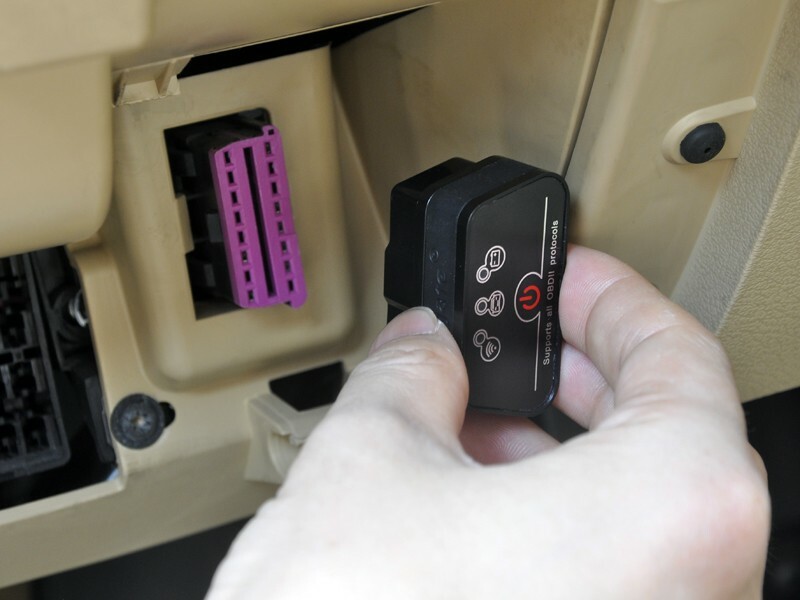 All vehicles manufactured after 1996 must conform to the OBD-II standard which allows physical scan devices (for example, ELDs) to access certain emissions-related data points via the OBD-II port to gather and monitor data about vehicle operations. The only thing that a driver needs to do to enable engine-connected logging is plug an ELD into a vehicle diagnostic port and then wirelessly connect an e-logging app to the ELD. Read also: How can you develop an Uber for trucking? What does an e-logging mobile app do? - date and time of day. Certain ELDs may include a GPS unit for location information. Otherwise, fleets may rely on a driver’s mobile device to capture the truck’s location when a duty status changes. An electronic truck logbook must also include truck and trailer number, name and address of the carrier, shipping documents numbers, and other details. The app on a driver’s mobile device processes the data received from the engine (through a wireless connection) and creates logs that can be edited by a driver. A dispatcher also gets access to driver logs for auditing using a separate fleet app that offers additional functionality. A dispatcher and a driver receive push notifications if there are violations or errors in the logbook. If a truck has been in continuous movement for a period of time that exceeds the HOS requirements, a mobile app sends a push notification to a driver’s phone suggesting that they take a rest. The app should send a notification at least 30 minutes before an HOS violation occurs. In case a driver hasn’t reacted to the alert, the push notification on the HOS violation is sent to the dispatcher who can settle the matter by alerting the driver in some other manner. An app can create Driver Vehicle Inspection Reports (DVIR); special forms needed for compliance inspection if a vehicle has been damaged during a trip. According to a new No-Defect DVIR Rule issued by the FMCSA, truck drivers whose pre-trip and post-trip inspections turn up no equipment issues or safety concerns no longer need to file a report. In the event that damage to a vehicle has occurred, an app can help drivers complete the DVIR, add photos of the damage, and sign the report electronically. Real-time communication features with individual and group chats can enable direct connections between a fleet’s headquarters and its drivers, helping companies improve their fleet management operations. For a drivera map attached to the app’s interface can include live traffic information, routing, and other important road-related details such as the location of truck stops, truck washes, service and maintenance stations, fuel, and Wi-Fi zones. For a dispatcher, a map can show the current locations of all the operating drivers. Additionally, an app for fleets may include features for monitoring driver behavior and statistics. Incidents of unsafe and wasteful driving, such as speeding, hard braking, and idle time, captured by an ELD, can trigger near-real-time alerts to be sent to a fleet manager’s app or to their email. An e-logging app’s interface is likely to be different for a driver than for a fleet manager. After all, fleet managers need access to broader functionality and data-storage capabilities that are implemented through backend solutions. We hope our article gave you some ideas of the technology and functionality behind HOS electronic logging solutions and how you can create driver's log book app. Your logistics business desperately needs a great mobile app?